Before I get to the Martha Stewart Living "Meatless" cookbook giveaway (CLOSED) and the Martha Stewart vegetarian chili recipe, I want to share a look at a few of the plant-based foods I have eaten this past week. 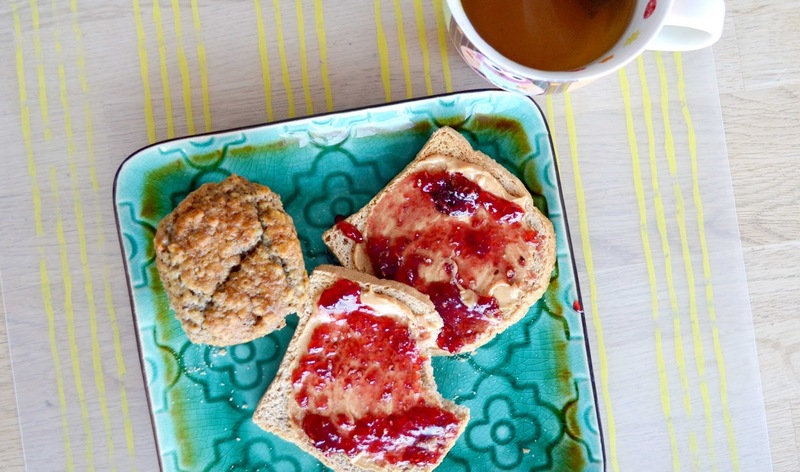 Breakfast is generally decaf green tea and spelt toast with peanut butter and jam - in other words, a classic, simple everyday breakfast combination. One day, I also enjoyed one of my favourite vegan banana muffins recipes. I put dates in these delicious muffins this time instead of chocolate chips. As long as it's sweet, I'm good with it! 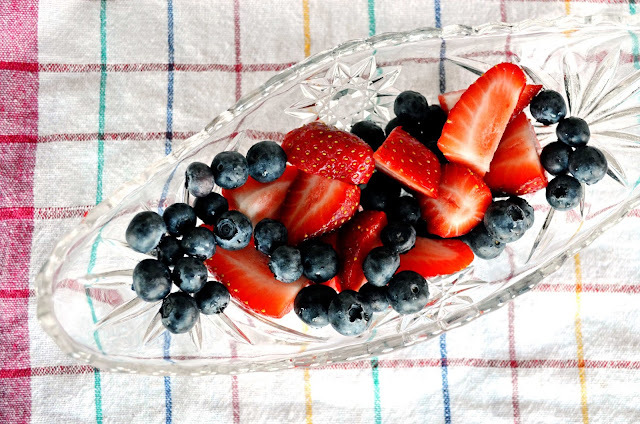 Today I had my toast along with a simple fruit salad of strawberries and blueberries. On Friday night, we ordered vegetarian sushi. It was difficult to get a good picture for two reasons: the lighting in the house at night is terrible, and the family was breathing down my neck (literally) wanting to eat their sushi. I have created a couple of little sushi addicts. I'm happy for them though. I regret that I came to maki sushi later in my life. Yesterday at lunch, I had leftover pasta. I served it with this Gardein Mandarin Orange Crispy Chick'n. Some people think it's odd for vegetarians to eat fake meat...but it's fake. This Gardein stuff is so delicious, I ate half the batch. It was hard for me to save some for others. *This post contains affiliate links. If you make a purchase after following a link, Woman in Real Life may get a small commission. Your price is not affected. 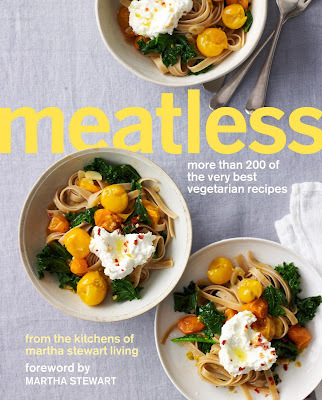 Meatless: More Than 200 of the Very Best Vegetarian Recipes is the newest cookbook from the kitchens of Martha Stewart Living. These talented food editors have created more than 200 simple, meat-free recipes, each with a gorgeous photograph. Using these recipes, you can prepare savory, satisfying meals that will please even the most avowed meat-and-potato lover. Did you note the word "simple?" I don't know about you, but that's important to me. Most of us don't have the time (or in my case the patience) to look for and prepare fancy ingredients. I was struck by how special the meals look in spite of the simplicity of the ingredients. As I mentioned in my weekly menu plan post on Sunday, my husband and I recently made a couple of recipes from the book. 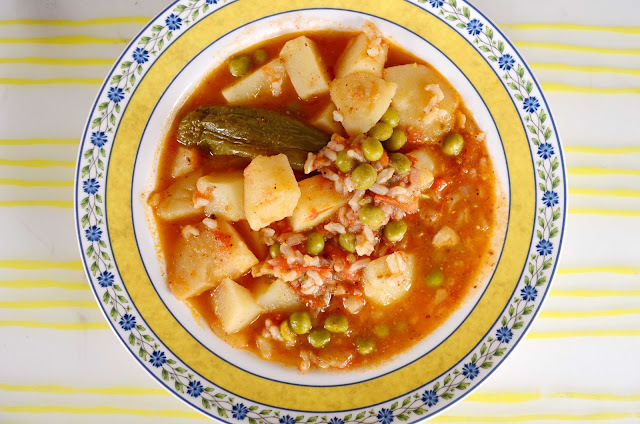 I started with the Pea and Potato Curry. I didn't exactly follow the directions to the letter. I thought I had the necessary spices in my cupboard, but it turns out I don't have coriander seeds or fennel seeds. I had the mustard seeds the recipe calls for and I used some cumin seeds (that aren't called for) too. Oh, and you're supposed to stir in Greek-style yogurt at the end, but I omitted that. Luckily, even with my changes, this recipe turned out to be quite tasty. It's a keeper. My favourite recipe, though, was the Roasted Fall Vegetables and Lentil Salad. It helped that my husband made it. Not cooking a meal myself always makes it taste better to me. We didn't have any French lentils, so we just used regular green lentils. I have to say the biggest surprise about this dish to me was how delicious the brussels sprouts turned out. I almost never have them because I'm not sure what to do with them. 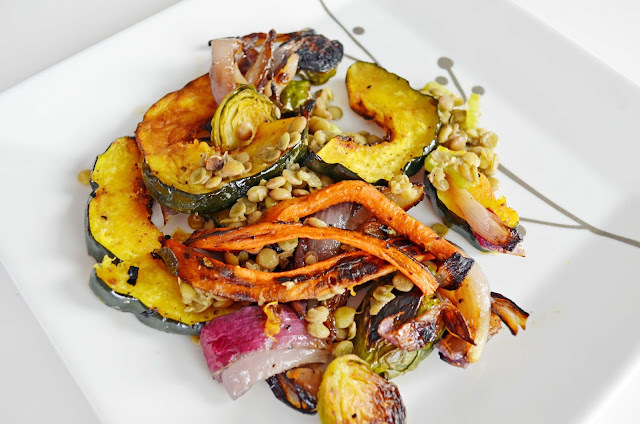 In this recipe, all of the veggies -- carrots, acorn squash, red onion and brussels sprouts -- are drizzled with olive oil, seasoned with salt and pepper and roasted in the oven. The lentils are cooked, mixed with celery, coated with a vinaigrette and laid over the veggies. 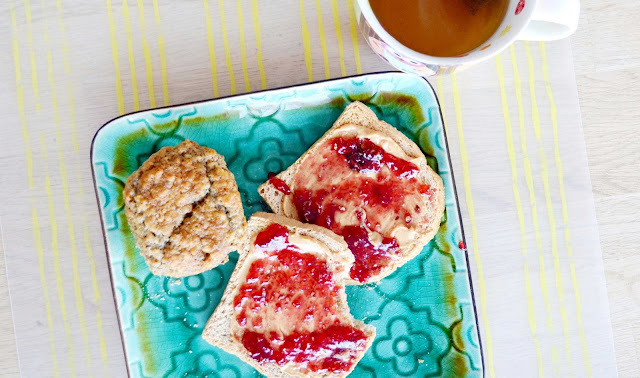 The ingredients are simple, but the results are amazingly delicious! It's also a vegan and gluten-free dish. These were wonderful, warm recipes for a winter's day, but, truth be told, as I flipped through the book I kept thinking about spring. There are so many lovely recipes that just beg for warmer weather -- recipes that call for simple, fresh ingredients artfully put together. The book is vegetarian (rather than vegan) overall but vegan recipes are marked in the index and at the bottom of each recipe. Same goes for gluten-free and special diet (although I'm not sure what that means). Many of the recipes could also be easily modified to make them vegan as well. I'm looking forward to trying the pizzas, the double-decker portobello burger and the warm edamame salad. Now that I'm more comfortable with brussels sprouts, I might even try the "Brussels Sprout and Lemon Skillet Pizza." The only thing the book is missing is a section on desserts. I know they probably rationalized that all desserts are meatless, but, call me selfish, I just want more dessert ideas. That's my sweet tooth talking. Now for a couple of recipes - a great vegetarian chili for cold days and a beautiful avocado salad for blessed spring time (bring it on!). This Martha Stewart chili recipe has become our go-to vegan chili recipe. It really is as versatile as the title suggests! It is super easy to make and I rely on this chili recipe when I don't feel energetic about cooking. Thanks Martha Stewart! 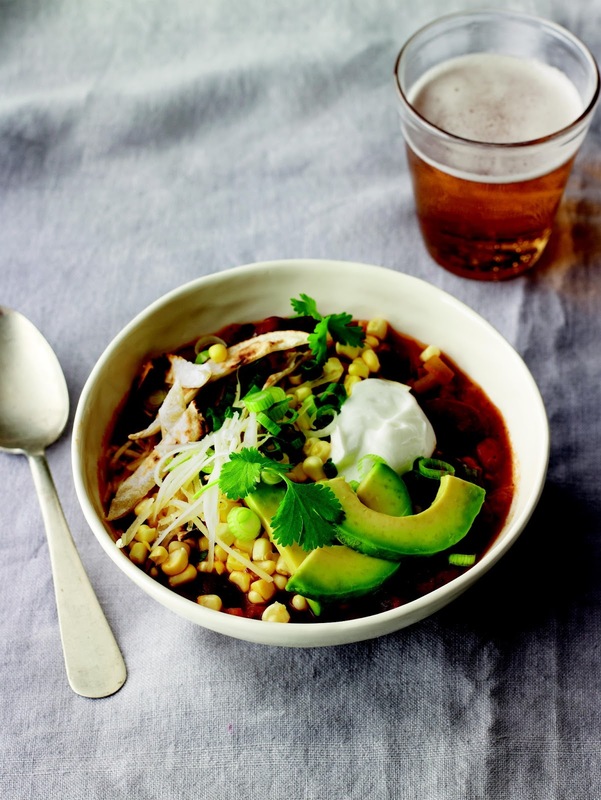 You can add more or less heat to this chili recipe. I use the can of diced green chiles and the chili powder the recipe calls for, but not the poblano chili. This results in a very slightly hot chili, which is my preference. The folks at Martha Stewart have kindly suggested beautiful ways of topping your chili too, so you can end up with a different chili every week if you want. 1. In a large Dutch oven or other heavy pot, heat olive oil over medium-high. Add onion, poblano, and garlic; season with salt. Cook, stirring occasionally, until onion is translucent, about 4 minutes. 2. Stir in green chiles, chili powder, and cumin; cook, stirring frequently, until spices are darkened and fragrant, about 3 minutes. 3. Add beans, tomatoes and their juice, and 2 cups water; bring to a boil over high heat. 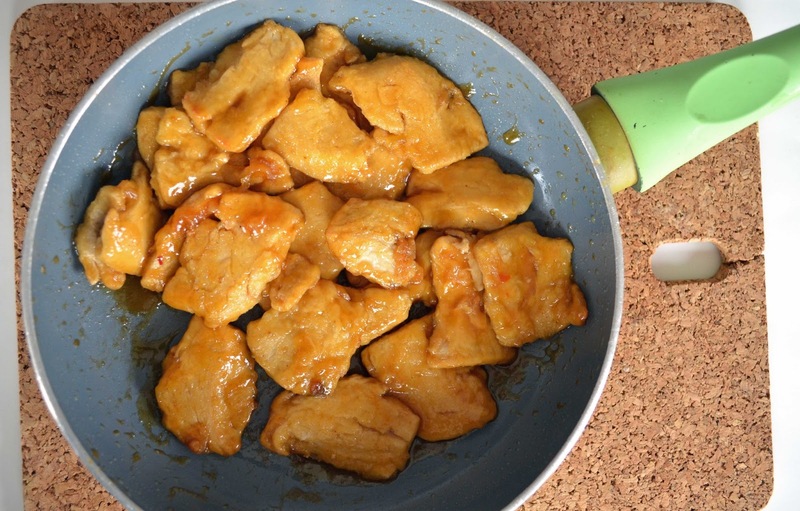 Reduce to a simmer and cook until vegetables are tender and chili is thickened, 20 to 30 minutes. 4. Remove from the heat. Season with salt. Serve with suggested toppings, as desired. Chili actually benefits from a little improvisation, and assorted toppings are a good way to change up the flavor and texture. In many cases the toppings can temper the heat as well. Toast whole flour or corn tortillas over the flame of a gas burner, turning with tongs, until lightly charred, about 30 seconds per side; let cool slightly and cut into strips. Swap in an equal amount of other beans: in addition to the pinto and kidney beans used in the master recipe, black, navy, and pink beans are all common in chili; black-eyed peas, chickpeas, or lentils would also work. Use just one type of bean or a combination of two or three. Just make sure to keep the total volume the same. Practically any vegetable can be added to chili; usually it will be cooked along with the onion and chile until tender, before the other ingredients are added. For a summer version, add up to 1 cup diced red, yellow, or green bell peppers (or a mix); sliced zucchini or yellow squash; or fresh corn kernels, alone or in combination. For an autumn chili, add up to 1 cup peeled, diced butternut squash or sweet potato; chopped Swiss chard, kale, or other sturdy greens; or diced mushrooms. Puree 3 pounds tomatillos, husked and washed, until smooth in a food processor or blender. Use this puree in place of the canned tomatoes in the master recipe. Add 1 to 2 tablespoons minced fresh green chile, such as jalapeño or serrano. (As a general rule, the smaller the chile, the hotter it is.) Or try adding 1 to 2 tablespoons minced canned chipotle chile in adobo sauce to impart a smoky flavor. Broil the vegetables for deeper flavor: Before getting started, halve the onion and poblano chile, and place cut side down on a baking sheet; add whole (peeled) garlic cloves and broil until just starting to char, then chop and sauté as directed. You could also broil a pound of fresh plum tomatoes, halved lengthwise, until softened and starting to char, then dice or puree in a blender; use this puree in place of the canned tomatoes. 1. In a small bowl, whisk together olive oil, lime juice, garlic, and cayenne. Season with salt. 2. Scoop out flesh from avocado halves, reserving shells, and chop. Transfer to a bowl and add bell pepper, tomatoes, scallion, and chopped cilantro. 3. Drizzle with dressing and season with salt. Gently stir to combine. Spoon mixture into reserved shells. Garnish with whole cilantro leaves and serve immediately. *I received a review copy of "Meatless." All opinions are my own. Enter to win your own copy of "Meatless", courtesy of Martha Stewart Living Omnimedia, using the rafflecopter widget below. Open to residents of Canada and the US. Good luck and happy cooking! 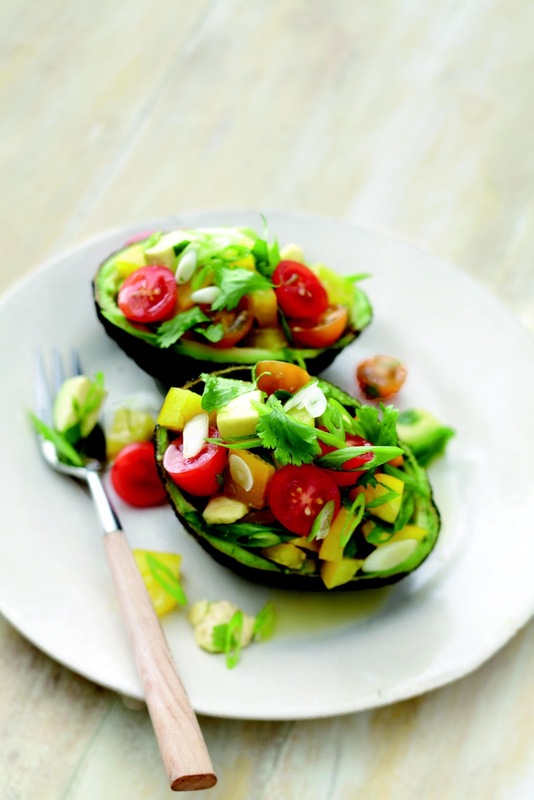 making the avocado salad tonight - sounds yummy! Yay! I needed a win after a semi-crummy morning. Thank you, I can't wait to try some new recipes! We have been ovo-lacto veg for 12 years, but we still get in ruts trying to incorporate veggies into our diet. Ironic, right? Your blog is so inspiring! You guys always make me want sushi, we don't get it very often but it is always fun. Looks like a great cookbook as well! Thanks for the great photos! I'm vegetarian and can really get stuck in a rut! Can I please eat that whole try of sushi? SO GOOD!! My fave meatless dish is stuffed peppers with quinoa! Vietnamese summer rolls made without shrimp or pork. So tasty and simple. So far, as I am new to going meatless, I would have to say my fav is feta, lentil wraps! I love sweet potato fries too! Yum! Simple is definitely good- our favorites lately have been egg based- frittatas, omelets, etc. All of these recipes look fantastic! Everything looks so so good! The lentils, the sushi take out, the roasted veggies... I swear I'm coming to eat at your house for dinner some day ;) By the way, my husband and I are planning a trip through Canada for our anniversary this summer... see you then! Hehe. Oh yum, all of it! Homemade pesto over gluten free pasta. So very nummy. OH! And capresi salad. Sigh. I miss my summer produce! As an aside, the avocado salad looks beyond delish! This looks fabulous! Our favorite meatless meal? Butternut Squash Bisque! The Buddah Bowl is light and yummy. Martha's books are always good. Meatless here might mean a pot of seafood chowder! These days, I'm loving a warm quinoa salad with green onion,red pepper, pine nuts and a balsamic/hemp oil vinaigrette. It's warm because I just can't wait for the quinoa to cool! Ohhh the Avocado Salad with Bell Pepper and Tomatoes looks so tasty. 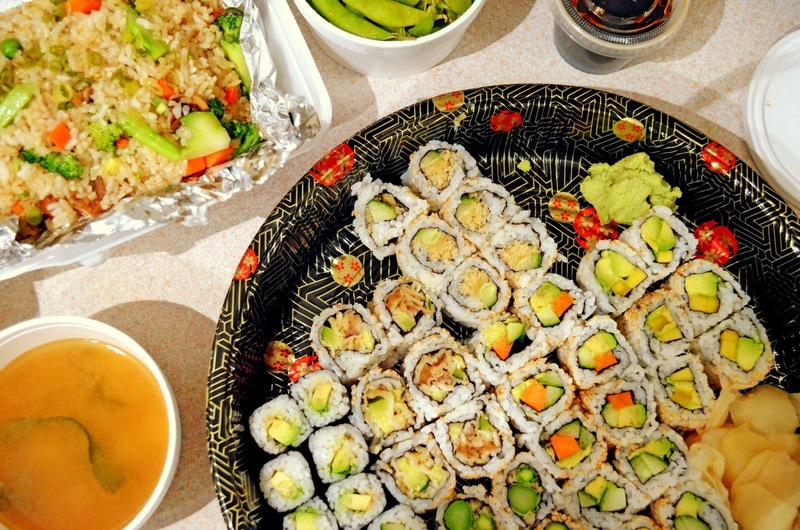 Bonus avocados are on sale by me so this is getting made for lunch tomorrow.Even though that platter of sushi is what is truly calling out my name. Almost everything I eat is meatless and I think my favourite meal is chick peas and kale cooked in a skillet. I hear you on the bad lighting on winter evenings! Spring is coming, thank goodness! Love the recipes you've shared today. And I love that you are giving away that awesome cookbook! My Mr. would especially love it! Forgot to say my fave meatless meal: a baguette split, buttered, and topped with avocado, salt, and almond slices....mmm. Spinach lasagna and I also love brocoli fettucine alfredo. The Garden Mandarin Orange Crispy Chick'n looks delicious. I would like to try that. The pea and potato curry also looks good. I would leave out the yogurt too. Roasted Vegetables in Olive Oil and sprinkled with Parm. cheese. Hard to choose as we're vegans but we make a pretty amazing butternut squash macaroni casserole. I love vegetable egg foo young! meatless chili, I got the recipe on morningstar farms website. It so easy. I loved stuffed shells with ricotta cheese! I love cauliflower dipped in sweet and sour sauce! Its a great meatless alternative to hot wings! In fact,I actually prefer it! Channa Masala! It's Indian it Garbanzo beans with yummy seasonings! The other night I made a baked bean soup and quick herb cheese bread from the Moosewood cookbook....so good!! That avacado salad looks great. There is also a chinese restaurant that I go to that makes immitation duck with bean curd that is delicious! My fave meatless meal is a good homemade mac n cheese...ciao4now64 at yahoo dot com. I Love making vegetarian low mein! Awesome more healthy meal ideas!! I will try ANYTHING with avocado. YUM! Thanks for sharing the recipes and for sharing with Raw Foods Thursdays!